Aside from increased literacy, Bituen have embarked on another critical issue in the country which is sustainable waste management through the publication of 3Rs of Fun in Waste currently available at Amazon and Etsy. The book, although still in its early release (October 2012) has sold more than a thousand copies and has been generating awareness through Inquirer and Philippine Star online and offline. In a recent No Impact program of the Asian Development Bank through the assistance of Ms. Carolyn Cabrera and Ms. Rhea Reburiano of ADB, Dir. 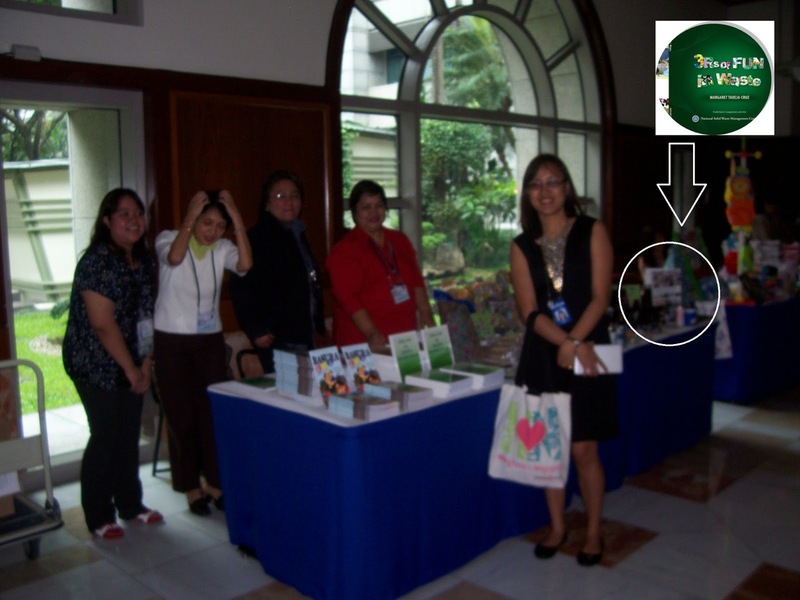 Emy Aguinaldo and Ms. Racquel Reyes of the National Solid Waste Management Commission secretariat, as well as the other officers of NSWMC and DENR, the book and the projects in the book were featured. 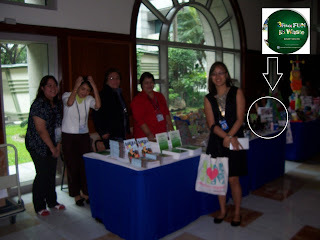 DENR officers, Ms. Reyes (in white) and Ms. Reburiano (in black) at ADB No impact Week. Bituen hopes that through these exposures, waste management at individual level becomes more extensive and taken into consideration by everybody. The various officers of ADB also pitched-in their take on how each one of us should adopt sustainable lifestyles including less waste, less carbon usage, support for local products and food, use of less energy (although personal physical energy is encouraged to be used in full) and use of less water. All of these are also tackled in the 3Rs of Fun in Waste. On January 21-24, DENR will also be celebrating the anniversary of RA 9003 or the Ecological Solid Waste Management Act of 2001 which relevant sections were included in 3Rs of Fun in Waste. For inquiries about the book, please call (63)-2-9941372 or 0929-2870628. More images about the ADB No Impact Week here. 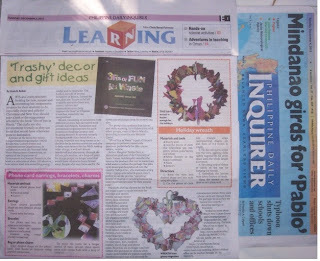 The December 16 Reading Caravan was conducted in San Vicente, Magsingal. The books were donated by Read Pilipinas, Ms. Carlotta Steven Fealy, Ms. Violet Whim Alderleaf, and Peace Corp. Support was also extended by the Office of Senator Bongbong Marcos. The Caravan was conducted with the help of Dr. Estrella Oliver Soria and her team of San Vicente Professionals' Association. The children are from daycare to Grade Six. In this program, we have introduced the book exchange wherein a volunteer coordinator will meet the children regularly to have their books swapped to maximize impact. We hope to partner again with the Association for more projects. 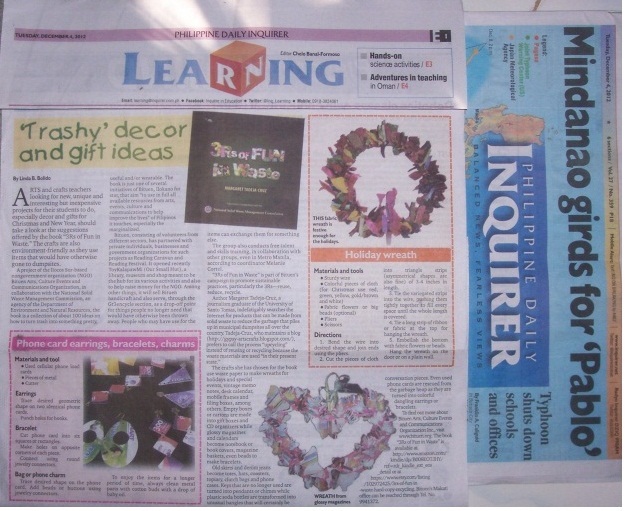 In December 30, the Reading Caravan was conducted in cooperation with the Saint Paul College of Ilocos Sur H.S. Batch '88 at San Pedro, Vigan City. It is said that San Pedro is a relocation site of marginalized urban poor in the country's World Heritage Site - Vigan city proper. The books have been provided by Read Philippines, Ms. Carlotta Steven Fealy, Ms. Violet Whim Alderleaf, and with assistance from Sen. Bongbong Marcos. Barangay San Pedro Officials led by Punong Barangay Magno led support to the book and school supplies distribution. The parents of the children danced with glee after the event.